The perfect conference table & chairs set. 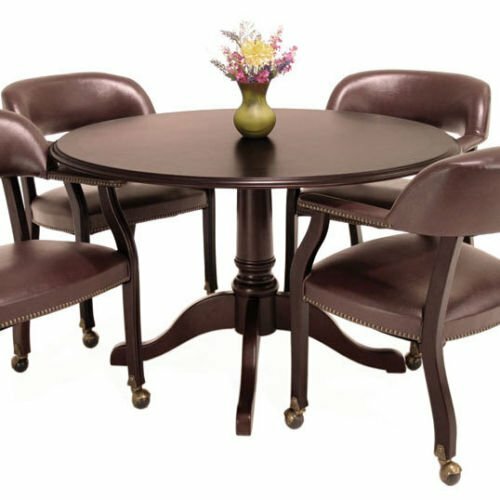 Traditional round conference table with 4 matching chairs. Table is available in 42" in diameter. Table and chairs are made from solid wood & hardwood veneers, and are in a mahogany wood finish. Wood surfaces are protected with a high-tech catalyzed lacquer for medium gloss, scratch resistant surfaces. Conference table features detailed edging & traditional, hand carved designs. Chairs have a leather-soft vinyl upholstery, and are available in a burgundy or black color. Conference table and chairs are very easy to assemble, are 100% brand new, and come with a five year warranty. FREE SHIPPING for anywhere in the continental United States. Curbside Delivery. Optional installation service for $150 per table and $25 per chair. Please note that larger furniture orders ship with LTL Freight Carrier. Standard Delivery includes them delivering to your loading dock. If your company does not have a loading dock, they will deliver to the curbside of your building. For larger orders the driver may need you, or your company's assistance to offload your order off of the truck. Please note that our Free Shipping service does not include inside delivery. If you would like the driver to deliver inside your building and/or office, most drivers would assist you if you tip them $10 - $20. Most drivers would not assist up a staircase, and it is the customer's responsibility to make sure that his/her freight elevators would accommodate the purchased merchandise, and that the elevators are working & operational. If you have any questions about this product by Office Pope, contact us by completing and submitting the form below. If you are looking for a specif part number, please include it with your message.